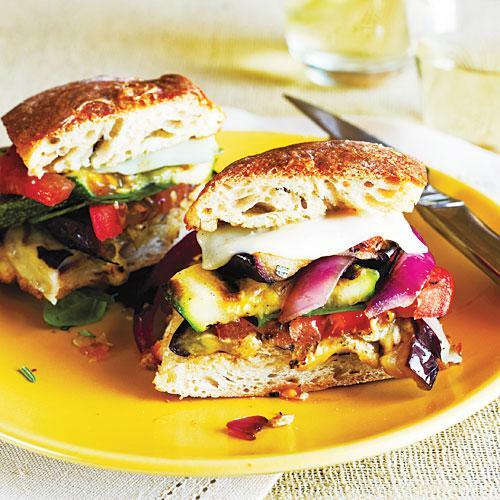 Grilled Farmers' Market Sandwiches - A & Z Pharmaceutical, Inc.
2. Brush 1 tablespoon olive oil evenly over both sides of eggplant, onion, and zucchini. Sprinkle with rosemary, pepper, and salt. 3. Combine 1 tablespoon oil and vinegar in a bowl. Brush vinegar mixture over cut sides of bread. 4. Place onion on grill rack coated with cooking spray, and grill for 6 minutes on each side or until tender. Remove from grill, and separate into rings. Grill eggplant and zucchini 4 minutes on each side or until tender. Cut zucchini pieces in half crosswise. 5. Place bread, cut sides down, on grill rack; grill 2 minutes. Remove from grill. Place 1 piece of cheese on bottom halves bread portions; top each serving with 1 eggplant slice, 1 tomato slice, 1 basil leaf, 2 pieces zucchini, one-fourth of onion rings, 1 eggplant slice, 1 tomato slice, 1 basil leaf, 1 piece of cheese, and top half of bread. Place sandwiches on grill rack; grill 2 minutes, covered, or until cheese melts.